Until recently using antiques in our homes had fallen a little out of vogue. No one wanted to be accused of filling their rooms with their parents or grandparents hand me downs, especially if your personal style leans more fresh and sleek. Recently we are seeing a return of antiques in a big way, especially layered in with modern interiors. I personally love the way an antique chest or an old hand knotted rug can give a contemporary room a touch of heart and soul. We are fortunate at Nandina because every year one of the premier southern antique shows takes place right down the street from our storefront. The Aiken Antiques Show is a treasure trove of some of the finest antiques dealers from around the southeast. This year I was asked to moderate a panel of designers (that are some of the finest taste makers in our region) as they discuss how to successfully use antiques in a modern home. That panel discussion will take place in front of a vignette designed by Nandina that features artfully selected antiques layered in a room of contemporary furniture, art and accessories. We will be posting pictures to Instagram and Facebook so that you can see the final outcome. Find out more information and how you can purchase your tickets at the bottom of this blog post! Below are four tips that will help you achieve a modern updated design that feels collected, warm and reflective of your personal style! One antique hand knotted rug makes a room, oriental rugs everywhere can feel traditional. 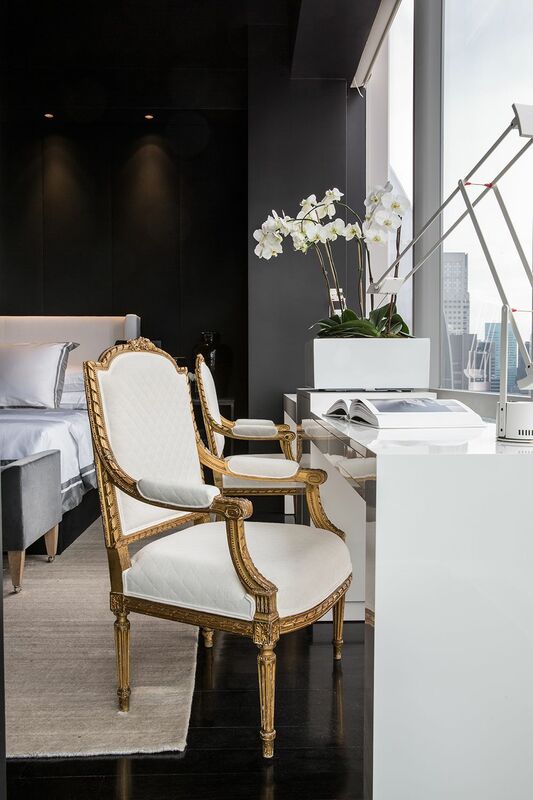 Don’t pair antique furniture together – an antique chair and desk together look antiquated where as a sleek modern desk paired with a French Brashear chair is the perfect juxtaposition for modern design. Re-cover an antique settee with a modern contemporary fabric, paint a vintage piece of furniture a bright color or add contemporary hardware to an antique chest. Never position all of your antiques in one area of the room, always layer them with contemporary pieces. A display of antique plates hung artfully above a contemporary sideboard, or an antique chest with a bold abstract painting hung above it as well as a contemporary bubble chandelier hung over a vintage Swedish style farm table all provide the perfect yin and yang for a modern layered design. Be careful with mixing too many styles in one room. A modern design layered with a couple of vintage or antique pieces can look interesting and collected – but too much mixing winds up looking confused and cluttered. Tying the room together with color and scale will blend the styles into perfect harmony. Don’t be afraid to selectively use antiques and vintage pieces in a modern design, every room can use a least one piece of history. Join us on 2/2 & 2/3 for a panel discussion at the 2018 Aiken Antique Show! This year’s Aiken Antique Show features a number of changes—a new name, a new brand, and a new focus. In addition to featuring beautiful antiques, it will focus on designing the contemporary home by using vintage and antique furnishings to create a layered and curated look. To illustrate this concept, Nandina Home and Design will create a vignette of contemporary furniture and accessories, coupled with antiques, in the Aiken Center for the Arts’ Brown Pavilion. In addition to the vignette, Nandina will host a panel of tastemakers discussing the ways in which you can create the same look using antiques you have inherited or purchased. We invite you to join Susan Victor, one of the owners of Nandina Home and Design and it’s principal designer, as she moderates a panel discussion with distinguished designers Bruce MacDonald, Jessie La Falce, and Melissa Hiner. We hope the vignette and lively discussion will leave you with ideas on how to use antiques and contemporary furnishings to create a home that represents who you really are. Please note that the panel discussion will be presented twice, once on Friday 2/2/18 at 9:30 AM and once on Saturday 2/3/18 at 9:30 AM. For more information and how to purchase your tickets click here. Susan, I am beyond thrilled with the information that you have distributed to everyone in your contacts. It is more than we could hope for. In addition, I so enjoyed reading your blog. What great advice for those who are trying to use antiques in their homes! It certainly caused me to wonder if I should do things differently. Your blog should create so much interest in the panel discussions. I hope we have a record crowd. Thanks again for all you are doing to help us launch a refreshed show! Thanks so much Suzette, Nandina is proud to be a part of The Aiken Antique Show! A very useful article to read. Thanks a lot for sharing this. Fine work. Keep it up.